The history of island is explored within many of Santorini's museums, which offer a pleasant alternative to the beaches and coastline. 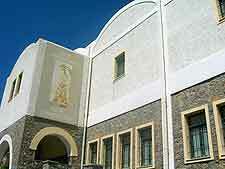 Popular subject matters covered within the museums of Santorini include archaeology, wine-making, art and maritime themes. 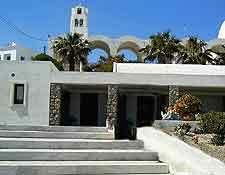 The majority of the island's main museums are to be found within Fira (Thira), the capital of Santorini. These include the Museum of Prehistoric Thera, one cultural attraction which deserves to be at the top of every visitor's itinerary, boasting a large collection of truly outstanding relics, which were excavated from the historical site of Akrotiri. Particular favourites for those visiting the Museum of Prehistoric Thera include an ancient gold figure of an ibex, which dates back to the 17th century BC, as well as some well-preserved wall paintings (frescoes) and other art works, a number of which are display within glass cases. The Museum of Prehistoric Thera is also home to fossils, pieces of pottery, a clay oven and more besides. To date, only a fraction of Akrotiri has actually been excavated and so the collection is set to grow over the years to come. Situated within the capital of Fira and easy to find, lying off the main road, the island's Archaeological Museum is close to the cable car station. This attractions houses various relics and treasures from both Ancient Thira and Akrotiri, including sculptures and figurines from Roman and Hellenistic times. There is a huge amount of pottery displayed at the Archaeological Museum, as well as a number of household items and some particularly impressive frescoes, which often depict blue monkeys, even though monkeys have never actually ever lived on the island. 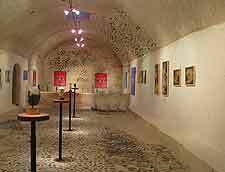 The Art Space Gallery is something for connoisseurs of modern art every and is actually housed within a mid 9th-century winery in the village of village of Exo Gonia. The traditional setting is full of character and as you explore the exhibits, you cannot help but be appreciative of the stone-carved chambers and characterful cobbled floors. However, the colourful contemporary paintings are well displays and offer an insight into the world of Greek modern art. The Art Space Gallery was founded as recently as 1999 and was gained much popularity ever since, exhibiting various temporary collections over the years. Standing just behind Fira's Catholic cathedral, the Megaron Gyzi Museum features a host of local Greek memorabilia, including some truly fascinating photographs of Fira. These photographs were taken before and after the devastating 1956 earthquake, clearly showing the terrible damage and destruction afterwards, when a number of 18th-century buildings around Fira simply collapsed and the face of Santorini was changed in simply a matter of minutes. Also on display here are some attractive engravings, which dates a far back as the 16th century. Offering an unmistakable nautical flavour and spread over two floors, the Naval Maritime Museum is an extremely inexpensive attraction and a good place to while away an hour or two. On exhibit are a large number of model ships, portraits and naval uniforms, although the labelling is rarely in English and so you will need to use commonsense to make to gain the best understanding of what you are actually looking at. Look out for the classic displays of various knots, as well as the historic oil lamps and the colourful figurehead of past ships. The Volcan Wine Museum is one not to miss and is sited within a huge natural cave, which is just a few metres below ground level and stretches back for around 300 metres / 984 feet. An audio tour takes you along the tunnel and explains all of the exhibits and models, which depict the Volcan wine-making process, from Vothonas vineyard to bottle. Particularly interesting is a wooden wine press, which is more than 350 years old. The guided tours last around 40 minutes and at the end of the tour, you will be treated to a short film documenting the history of winemaking in Santorini, before being given the opportunity to actual sample a number of the actual wines. If you are here on a Friday, you may be interested in staying on for the traditional Greek buffet and live entertainment.